An airmass is a large (usually thousands of miles across) volume of air that has horizontally uniform properties in terms of temperature, and to a lesser extent humidity. Airmasses acquire their properties from spending days to weeks over the same part of the Earth: say over northern Canada, the North Pole, the tropical Pacific Ocean, etc. Polar airmasses become very cold, especially in the winter, because relatively little sunlight shines on the poles of the Earth, and so the air mass continuously loses infrared radiation to outer space, which cools it, with little or no sunlight to offset that cooling. A "continental polar" airmass will be somewhat colder and less humid (from being over very cold land) than a "maritime polar" airmass, which has been somewhat warmed and moistened by the ocean. A "tropical maritime" airmass will be very warm and humid. A "tropical continental" airmass usually covers much of the United States in the summertime. Other airmass types include "arctic", "equatorial", and "monsoon". Fronts are the boundaries between air masses of different temperature. Extratropical cyclones (low pressure areas) also form along these fronts and draw their energy from the temperature difference between air masses. 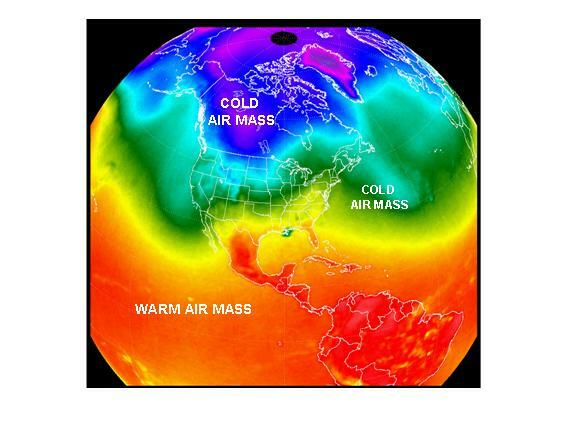 On average, warm air masses tend to flow poleward, and cold air masses tend to flow equatorward, helping to cool the tropics and warm the polar regions.